When Did You Know Your Dog Was the One For You? We asked our Facebook fans, When did you know that your dog was the one for you? Your answers were so heartwarming and touching, we needed tissues to read them all. We were especially touched by our first answer, as we are so incredibly happy that we could play a small part is this love affair. Thanks everyone for sharing. When I looked into their eyes and felt the instant connection… All three of my babies were spontaneous adoptions, and I regret none of them!! Once I read her bio on PBRSD, I was sucked in. Then when I went to meet her at her foster home…her big brown eyes drew me in even further. I believe animals choose you, and Rayne did just that. She knew I would never give up on her…no matter what. When the pit I was fostering put her paws on my shoulder and licked my tears the night before she was supposed to leave, that was four years ago and she’s been an amazing part of our family since! I could not let her go! As soon as our eyes met! I knew she is going to be my most cherished companion four life. The moment I saw him; my husband was supposed to pick out a dog, I told him he still could as long as it was him… He’s the life in my eyes when I smile! 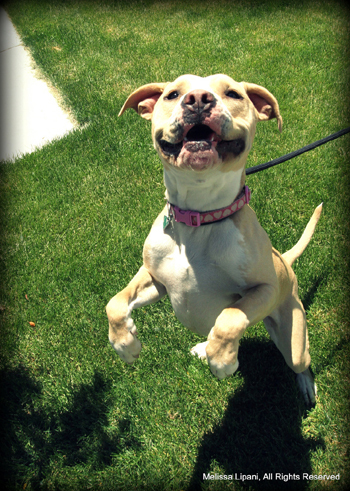 I saw our precious pittie on Petfinder. I fell in love with her pics immediately. She had such beautiful golden eyes and such a sweet, sensitive looking face. We weren’t really looking to adopt/rescue a pooch, but for months I just kept going back to Reesi’s pictures. I found out she was being sheltered by DowntownDog Dallas . My hubby said, “Let’s just go meet her. What have we got to lose?” (He was always a Golden Retriever kind of guy. 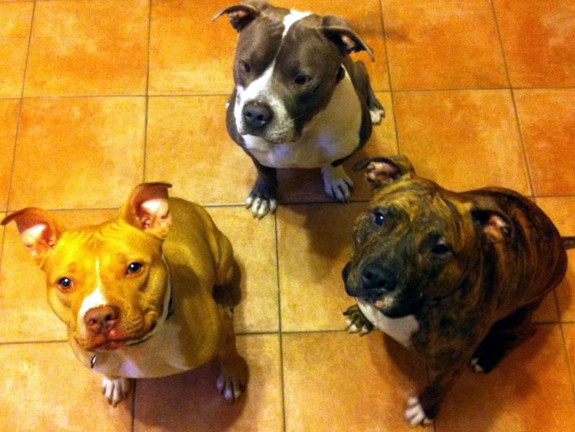 I’ve favored pitties since my daughter adopted one.) Well, when I caught my first real-life glance of our beautiful girl, my husband took one look at my face and knew it was all over for me! We brought her home that day and it was one of the BEST decisions he and I have EVER made. She is the dearest, most precious, good-natured dog and the three of us make quite the pack. To top it all off, she is wonderful with our five year old grandgirl. Reesi and Baylee absolutely adore one another. When she gave me no other choice than to keep her. When I took him into the adoption viewing room and he went to the bathroom all over the place… then ran and jumped in my arms and gave me the “Hi, I love you already!” look. I took him to a company picnic as an “adopt-a-bull” but we bonded throughout the day and then on the ride home he climbed over my center console to put his head in my lap while I drove. I melted. He hasn’t left my side since. When Skye’s (then Remy) picture was sent to the shelter where I worked, I said to a coworker “That’s my new dog.” I was joking, but when she arrived in need of a foster, I volunteered. Two months later, when her numerous medical issues were solved, it was time to put her up for adoption. Instead, I adopted her to myself! First night we had her was bed time she jumped in our bed waited until my wife and I got there and gave us a little attitude trying to tell us she was boss. She crawled under the covers and slept tight up against my wife. Five years later, she is still the boss and spoiled rotten. At the adoption drive, I took Chance out of the crate to play, even though I was looking for a female dog. He ran around, then ran onto my lap, rolled over onto his back and looked at me with his goofy upside-down smile. Dogs choose you and I knew it was over for me. We rescued each other and he has brightened my world one bounce and pittie-smile at a time. With Haley, I knew she was the one when her then-foster mom opened the door (Haley was one of 3 pups there) and she came wiggling right over to me and hopped in my arms. She was literally the cutest thing I’ve ever seen and I could just tell she would be the most loyal and wonderful (and mellow!) dog. Our pittie Molly became “mine” when my now-fiancé and I blended our families. He picked her up before we were dating from a family that had listed her on Craigslist. We were friends at the time and I told him he HAD to get her before someone else with bad intentions did. When he went to see her, it was apparent that she was in a bad situation, always locked away in a crate in a garage without exercise or human interaction. She was pretty wary of him at first but soon started to play and he realized that there was no way he could leave her there. She has certainly been our “challenge” but is also fiercely loyal and gives love like no other dog I’ve ever met. 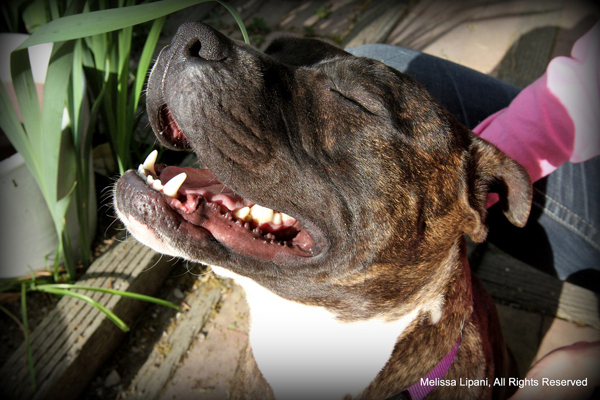 Luckily Haley’s “chill” compliments Molly’s “vigor” perfectly – like dogs, like owners. When I walked into Petsmart to actually adopt another small fluffy dog, I saw Castro sitting all alone in this shopping cart just looking so small and innocent, my heart sank. I was asking everyone if this was their dog, and a lady said he’s up for adoption and I did not leave his side. I felt it was meant to be as the other dog I came to get never ended up coming in that day, apparently she was not ready. And he had already stolen my heart, there was no way I could leave without him. He is a amazing dog and I love him with all my heart! Quite simply put …… When she told me so ! I happened to be there when Francis was abandoned (tied to scaffolding). Right before animal control grabbed him, he made eye contact with me and my mother. That was it! We asked where they would be bringing him and it turned out to be the animal control center around the corner from where I was living at the time. I wasn’t looking for a dog, had never been to that neighborhood before, and it just so happened that he was going to be in a shelter less than a block away: Fate! When I had to tuck her under my shirt to keep her from getting motion sickness during car rides or was it when every time you poked her while she was sleeping she would grunt. My dog’s bio was four pages at the humane society, yet the previous owners had only written two words on the front page…”he’s stupid.” Took him out to the play room for some one on one. There I got a feel for his personality and realized he’s not stupid, just not properly trained nor was he exposes to human or animal contact. I knew right then he was the dog for me because it was going be a chore to bring him back around and I (sorry for ego) didn’t think anyone else would take him. Had him for two weeks and my wife turned to me and said “I can’t take it we have to get rid of him.” Much training and two years later, my wife said to me “I’ve had a lot of dogs in my life and this is the best dog I ever had!” He is now known as the love dog. So much for stupid. Smartest dog I’ve seen and quite the vocabulary. With Harper, we were not even looking for a dog. He was with a rescue at the farmer’s market and as soon as I saw him, I knew I had to have him. A few months after we got Harper, we decided we wanted a second dog, and we wanted a pit bull. I wanted a black or black and white one and I always said I would name her Delilah. We looked at one pit from a rescue, but she was very rambunctious for my boys. The rescue called the next day and said they just got a new pit in, a girl, she was black and white, and her name was Delilah! How is that not a sign!?! I got her to be a playmate for my daughter’s dog. A foster, and I would find her a good home. It took two days to convince my husband, but I was sold on the first day. I didn’t. Chiyome told me she was my dog, and she was staying. I didn’t argue. The second he came romping around the couch playing with his brother, he saw me and immediately laid down rolled over onto his back showing me his belly I knew he was the one for me. Ten years later Thor knows he’s still Mommy’s Little Man. Specifically my Fergus because he was literally a bag of bones and the shelter had permission to put him down if he didn’t improve … I knew he was the one when I looked in his eyes that I wanted him to have a better life than how his started out. The long answer? — Gooch (brindle in photo) picked me the when the thanked me with a big sigh and a gentle kiss for bathing him, getting the poop off, and giving him some dignity. I heard he had come back from a foster because of a fight which meant he had some issues. I’d clean his kennel nightly and I could see the confusion and sadness in his eyes, more so than the others. The front of his kennel had a hand scrawled sign that said, “FOR THE LOVE OF ALL MANKIND NO TOYS AND NO BEDDING!) He was not permitted bedding or toys because he would destroy them and ingest them. (he could eat, not tear up, eat, an entire large black Kong in under 30 minutes). He would jump in his kennel all day, and when I’d turn the lights off to close up the night shift I could hear him jumping, still jumping. Puca (the red-nosed Corvino in the photo) picked me when he sat in my lap and kissed me for walking him. He was at the same rescue Gooch came from. I was responsible for cleaning and feeding him. Due to his growing up in a kennel, in a pen I consider too small, he became food aggressive. I’d come in from my days off or for the evening shift to find his full food bowls outside his kennel because the previous shift was too scared to feed him. Only a few people were willing to walk him. I’d make him my last walked dog of the night and take him for a slightly longer walk to burn off some energy. When I left the rescue I couldn’t bear to leave him, so he came with me. Dino (the blue AmStaff in the photo) chose me when he collapsed while I was walking him to a play yard. Dino came to an open admission shelter I was working at with his girlfriend Pebbles. Because they were not spayed or neutered we could not house them together. Pebbles did fine and I was actually considering adopting her. Dino didn’t eat for four days, he stood in his kennel and growled at everyone that came near him. I noticed on the 4th day that he was cross-eyed and I assumed his vision and his lack of his partner had made him scared. I slowly gained his trust over an entire day and finally leashed him and walked him out to the yard. We became friends and I assumed I’d be trying to work with him to get him adoptable. Sadly the next day I noticed his kennel cough was worse and as we walked to the yard he faltered and collapsed/laid down and wouldn’t get up. I coaxed him back to his kennel and took him home that night to foster. We lived in the unfinished second floor for about a month, separate from my other two. I force fed him three boxes of Nutri-Cal to keep something in him and sub-Qed two bags of fluids over about a week. Finally he got over his cough and began to recover. He joined the group after he was neutered. Today they all live together. Dino is working on trusting people and overcoming his vision issues. Puca has zero food issues and is learning to not be afraid of people. Gooch is currently the Assistant Volunteer Manager for the shelter I work for. He can be found in the volunteer office greeting volunteers every Thursday and Saturday. The short answer? They picked me the instant I realized there was a real possibility I was the only one that would pick them. When he was in the box. When we had to go back to the shelter to pull him out. We just couldn’t bear the thought of Chase spending one more day there or even worse being put down. He was born on my boyfriend’s birthday. I actually knew with Spartacus when the foster mom brought him back to the shelter. We were leaving the building and she was bringing him in. He was so skinny and I just sat down and he came running to me. One kiss and he had us, ever since then he has become our best friend and furkid. When he was about 5 days old and being bottle fed. He was the runt and I fell so in love with him. All my babies were the runts. I saw him online at Petfinder. My recent pup of 16 years had passed away. It was hard for me. She was with me a through all my childhood years while I was sick. I missed having her. Then I went to the shelter to see him. He looked at me like he knew I came to save him. Little did he know he has saved me. I’d adopted a Blue Heeler without any idea how hyperactive she’d be; so I started taking her to all the local dog parks. 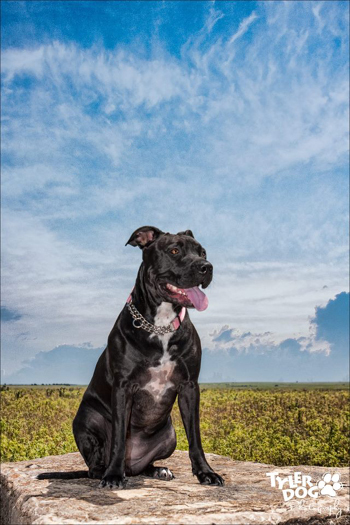 Her favorite playmates turned out to be Pit Bulls; and at our favorite Norfolk dog park, she started playing every day with a little gold AmStaff, Fergie. I discovered that Fergie was a rescue dog, in foster care. 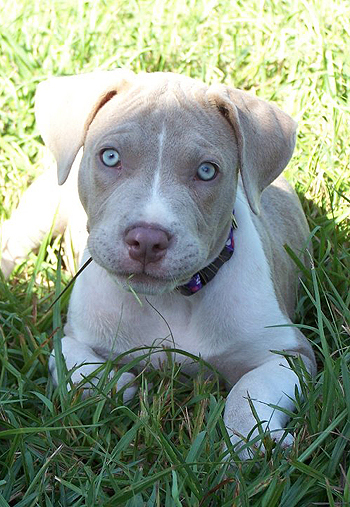 I’d heard terrible things about “pit” type dogs; but over a month of watching this little dog, I saw only sweetness. There was no hint of inconsistency in her interactions with dogs, puppies, people, or kids. After a month, her foster-dad started interviewing prospective adopters at the park… and I just couldn’t stand it. I realized I’d already fallen in love. Fergie came home with us, and she’s the Sweetest Dog on Earth. I walked into the shelter knowing I wanted to save a pit… I pulled one little female and the guy told me I couldn’t adopt her… she just came in and had stay awhile…. I went back and caught Diamond’s (now Bella’s) eyes…. I grabbed her, she went right for my sons face and licked it clean…. my husband looked at me and said.. “I don’t think she will be going back into that cage,…. Love my Bella!!! I knew Nola was the one the first time I walked her. My boyfriend begged me for over a year to get a dog. Our fridge was covered with pictures of dogs at the humane society he thought we should adopt. I kept saying no. Until the day he emailed me at work “just look with an open mind. 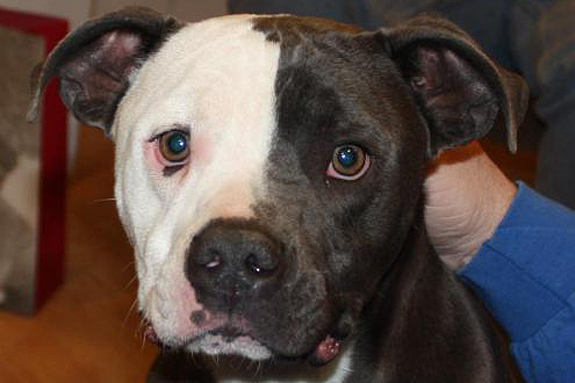 He dies Tuesday if no one adopts him.” One look at that face and I was sold. He was over four hours away, but I sent my boyfriend to bring him home. Ziven knew it was home, he fell into my arms like he had been there all along. Someone was trying to sell her on the street for $60 and if she didn’t sell he was going to put her in the dumpster at the end of the evening. At 9 pm when her time was almost up, she came home for $30. This is an easy one! When the 12-week-old puppy crawled out of his crate at Philadelphia ACCT and straight into my husband’s lap! When we saw Sherman at a local adoptathon. Hundreds of people and he was looking only at us. We went with one dog and came home with two. I actually wanted another pup at the shelter but she’d just gotten adopted. My boyfriend insisted Leche was the one for us and we brought her home at 4 months. I have no idea when I knew she was THE ONE but I’ve never looked back. She is the love of my life and there isn’t one day that I don’t tell her just that. I hope it worked out just as well for Charlotte (the pup I wanted). A friend of a friend sent me Joe’s picture, because people knew I would take in a stray. I went to the house and Joe was in a cat carrier with no food or water, his ribs sticking out and he had mange. The door opened and Joe ran into my arms licked me to death and we’ve been best friends since. I was volunteering at the humane society when I fell in love with Diego (he was Richard at the time…ugh). I’m not even really sure what got me, but it was definitely love at first walk. I promised him I’d be his forever home, and then jumped through hoops to seal the adoption deal. To be honest, if I hadn’t looked in his eyes and made him that promise, I might not have followed through. I wasn’t really looking for a dog or prepared for one, and the home inspection process was kind of an expensive nightmare. But, I couldn’t bear to think of him staying at the shelter after I had promised him a home. We’ll celebrate his second adoption anniversary at the end of the month and I’m thankful for every moment with my amazing baby dog! I first noticed Madelyn’s toes, they reminded me of fingers. Then she looked at me with golden eyes and leaned her neck close to the kennel fence for a scratch. l told myself and everyone else that I didn’t need another dog, every day as I thought about her. I started to visit her on Saturdays and brought my dogs along and all go for walks. I would call during the week to see how she was and would start to cry. After a weak attempt to find a home for her, I adopted her. An abused and abandoned bait dog that had been spayed and housebroken, go figure. She is a much loved member of the family pack. It has been a joy to watch her personality bloom and to trust again. She is a sweet, beautiful, happy soul. When my friend stopped by my house at 11:30 at night holding the cutest 3-month-old puppy I’d ever seen. He handed Roscoe to me and asked if I knew anybody who could give him a home. One look into those soulful golden eyes and his search for a home was over. His eyes have been a source of love and strength for me ever since. I once had a boyfriend tell me he wished I looked at him the way I looked at my Roscoe! My dogs came to me, not me to them. So, if they felt that I was good enough for them, I was honored to have them in my life. When she passed out “sitting” up with a mountain dew can in between her paws. And my husband tells me I love her more than him!!! 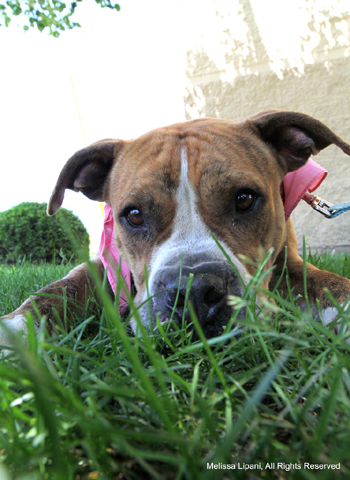 Maia had been picked up on the streets as a stray and taken to a “shelter” that automatically euthanizes all pit bulls when their three-day stray hold is up. But in that three-day period she had apparently charmed the socks off the staff and when they took her back to put her down they hesitated. They talked about who they could call to come get her. While they were discussing this Maia sat, she laid down, she gave them her paw, she licked their hands. It seemed she was trying to show them what a good girl she was. 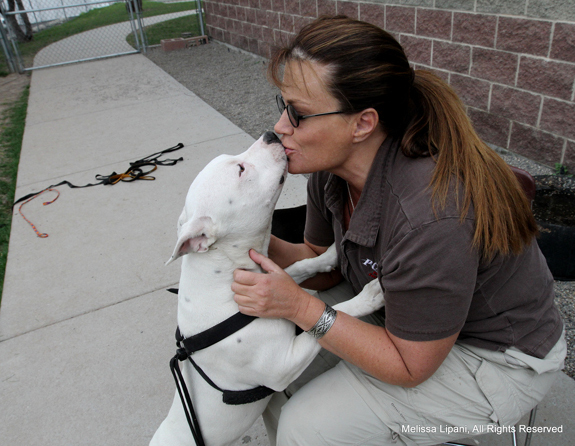 They called a woman who actually runs a German shepherd rescue but who has an affinity for pit bulls. She came and got her. 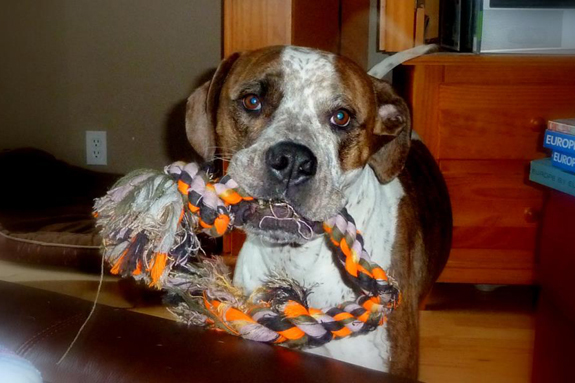 When I found Maia’s story on Petfinder I knew that this was a dog who very much wanted to live. She saved her own life and I so admired her for that. I just knew that this was a very special being. I was right. And she’s living a WONDERFUL life. When just days after bringing him home for a “trial run” he saved my then 1-year-old son from eating a broken light bulb out of the trash … and they’ve been completely inseparable since! Plus I’m reminded of it every morning when they wake up and the first thing they do is say good morning to each other. When I turned around and all I saw were these beautiful golden brown eyes surrounded by light brown patches in a white face with light brown dipped ears and a cute reddish pink nose. There was a golden aura around her and all I had was tunnel vision amidst all the people coming up to our ticket booth at Oktoberfest. I knew she was being brought to me to look at for a forever home but I wasn’t sure because she was a “pit bull.” All that flew out the door. I met her mama and papa three days later and she came home with me that night. She saved me one painful night by throwing her paws around me from behind and kissing away my tears. When I was told that he (and she) would be euthanized. This is how all my dogs find me. My purpose is to save lives and in turn they give me life. 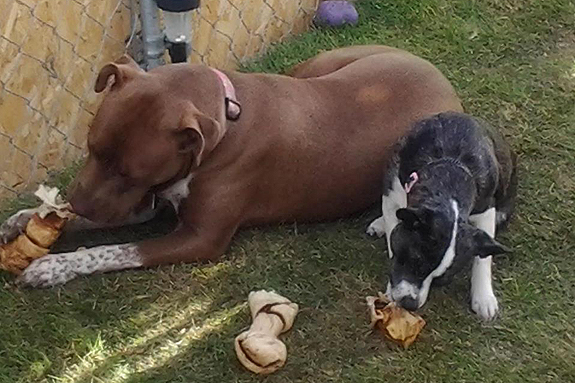 And each dog who adopts me are the absolute best, sweetest pups ever!! Because she sits on MY lap and MY feet and no one else’s. Gypsy is my baby. When I saw his photo on a ‘euthanasia’ list. There was just something about that photo that called out to me. My daughter and I drove all the way to New York City to get Zeke, and he has been a blessing every day. ~ Berwick Louisiana, it’s discriminatory Breed Specific Law, one-drop rule. When I walked her out of the cage at the rescue and she licked my face. I was sunk. The second I passed his kennel in the shelter… I saw his big blocky head and knew it. We walked by… but then after meeting a few dogs, I said I wanted to go find ‘dog named Oil Change’… once we took him into the run, it was a done deal. Love. For my latest, it was when I went to the casino parking lot to pick her up for fostering. When her rescuer jumped out of her truck with her – one look at that happy little pocket pittie and I thought “I’m in trouble this time!” More trouble when my 5-year-old big male Ziggy fell in love with her crazy playfulness, and the deal was sealed when she met Bomber, 12-year-old Elderbull, fully respecting her as the beautiful senior she is. Vixen became my first foster failure then. We saw Nina’s photo online first, and decided to go meet her at the shelter. We asked to see three of their dogs, and at this shelter they put you in a room with a couch and some toys and treats, and bring the dog in to you for some one-on-one time. The first dog was too “hot,” bouncing all around, stepping on our guts, and being generally rambunctious. She was so happy to be out and about that she wouldn’t even take a treat or sit still long enough for us to pet her. All totally understandable for a young dog in a shelter. The second dog was too “cold.” She slowly came into the room, and hesitantly sat up on the couch with us for some petting. She hesitantly took some treats, and mostly looked out the window, seeming very depressed. Also very understandable for a confused and abandoned dog in a shelter. Nina was the third dog they brought out for us. As soon as the volunteer cracked the door, she shoved it wide open with her nose, lept into the air, flipped upside-down midway, and landed 6 feet from her starting point, splayed out belly-up across both of our laps. She immediately started kissing us all over our faces. She was just right. We were hooked. Herman was special from the start. My incurably ill mother lives with me so I wasn’t taking any chances. I went to visit the friend who took him in temporarily as a favor to the previous owners who couldn’t care for him anymore. A short visit convinced me that Herman (then “Hammer”) was a good fit. I wasn’t looking for a dog at the time but wanted to help this lil’ guy, so I agreed to be a short term foster. Herman’s gentle &affectionate nature won my heart. It was clear that he had chosen his new home. I’m blessed the home he chose was mine. Herman was special from the start. My incurably ill mother lives with me so I wasn’t taking any chances. I went to visit the friend who took him in temporarily as a favor to the previous owners who couldn’t care for him anymore. A short visit convinced me that Herman (then “Hammer”) was a good fit. I wasn’t looking for a dog at the time but wanted to help this lil’ guy, so I agreed to be a short term foster. Herman’s gentle & affectionate nature won my heart. It was clear that he had chosen his new home. I’m blessed the home he chose was mine. Our Maddie (short for mad hatter) saved my 5 year broken heart. She, a ‘shepherd mix’ picked us by ignoring all others. We came to find she was a breedist and would only play with the pibbles at the park. I stumbled across this beautiful face, creamy caramel and white with adoring green eyes that seared into my soul for almost a month. I convinced my hubs to go and take a look, just to see if anyone matched our family. I wanted to give another pibbles a chance but I was pretty set on Wilma. Needless to say when a visit with another pup did not go well with Maddie, hubs was ready to leave. I wanted, needed to meet Wilma just to see if anything. She was skinny, starved and instant buds with her now daughter Maddie. The two of them ran around together for a while, came up to us together, and laid their heads in our laps to tell us we needed to add to the family. I knew. The hubs was unsure, she was a pitbull after all. He had heard about ‘those’ dogs. The first night, we had some problems and Wilma bit Maddie over food. It was 100% our fault but the hubs wanted to get rid of her. He didn’t want to take her to the shelter, he knew they’d kill her. We couldn’t take her back to the sanctuary we got her from, she had been returned twice and couldn’t bear to keep her from a loving home. Months passed as he searched for another home. One night we were walking them and Maddie and him got too far ahead, Maddie sat and waited for her mommy bull to catch up. He knew we were a pack and couldn’t split them up. He’s now the biggest fan of pibbles and is beyond glad no one would ‘take her off our hands’. Phoenix came to us as a foster. He was the son of a furbaby that we had recently adopted, The town that they came from had recently passed BSL, and Phoenix was at risk of being put to sleep. The rescue group called me and I reluctantly agreed to foster short term. He was with us for around six months when someone called wanting to adopt him. We had a very unusual feeling about this person, and I wasn’t sure that Phoenix and her were going to be a good fit. I stressed my concerns to the rescue, but all of the references checked out and she was approved to adopt. Our only other option was to adopt him ourselves. My daughter who was 5 at the time cried and pleaded with me to keep him. Her exact words were “That lady won’t ever love him like I do, and he will never lover her like he loves me! He will die of a broken heart if he leaves me!”. As soon as the words fell from her mouth, I picked up the phone and called the rescue back to let them know he would not be leaving our home. A few months later I got a call telling me that the interested adopter ended up on the DNA list due to her husband recently getting busted for being a ring leader in a pit bull fighting operation. Had Phoenix not chosen my daughter as his…. Well, I don’t even want to think about what would have happened to him. What a heart-warming post to read this Friday morning. This community is incredible! It makes me so happy that it makes you all so happy to help with Harvey’s adoption. He is just so amazing and we couldn’t be happier! 🙂 I am going to post a picture of him with his fur sister Laila on Facebook for you!